Samson's new low-cost nearfields can produce a big sound, but do they measure up for serious mixing? We find out. The A6 is a two‑way active speaker from Samson, priced to compete in the crowded budget monitor market. The smart and robust MDF cabinet contains a silk‑dome tweeter and an unusual woven carbon‑fibre woofer, driven by 25W and 75W of amplification respectively, and crossing over at 2.3kHz. Around at the back are balanced and unbalanced inputs on XLR, TRS jack, and RCA phono connectors, as well as a couple of rotary controls for level and HF contour (the former uncalibrated and the latter switched in 3dB increments). So what kind of sound do you get? A big one, for a start: certainly enough to wake up the neighbours and get a vibe going for tracking sessions. Things started to get a bit ragged as I reached the top end of nearfield monitoring levels, but that's only to be expected at this price, and for most small‑studio applications I can't see it being a serious limitation. In terms of timbre, these speakers deliver a larger‑than‑life sound, combining a fairly bright high end with warm and flattering bass. The silk domes help to avoid the HF becoming abrasive, and as I'm quite used to forward‑sounding monitors I didn't feel the need to adjust the HF contouring. The frequency balance helps to give a sense of detail, but there's not really the definition to stop high frequencies in vocals, drums, percussion, and guitars splashing about, which makes it harder to isolate the contributions of different sounds to the mix. At the low end, the warmth enhancement appears to have been delivered using fairly aggressive resonance at the roughly 32Hz porting frequency, leaving bass lines uneven and kick‑drum levels tricky to judge against them. In addition, strong sub‑bass components remain effectively undetectable, given the speaker's precipitous LF roll-off (roughly 30dB/octave at 30-60Hz, judging by the rear‑panel frequency‑response plot). Unfortunately, things don't fare much better in the mid-range, which seems quite coloured, and struggles to present true‑sounding vocal tones or offer reliable insights when referencing mixes against each other. For similar reasons, balancing complex musical sounds accurately against each other is likely to prove daunting, no matter what your level of experience. The A6's rear panel hosts the balanced XLR input and IEC power inlet, as well as controls for volume and high‑shelf filter level. The Resolv 120A active subwoofer came with the A6s for review. 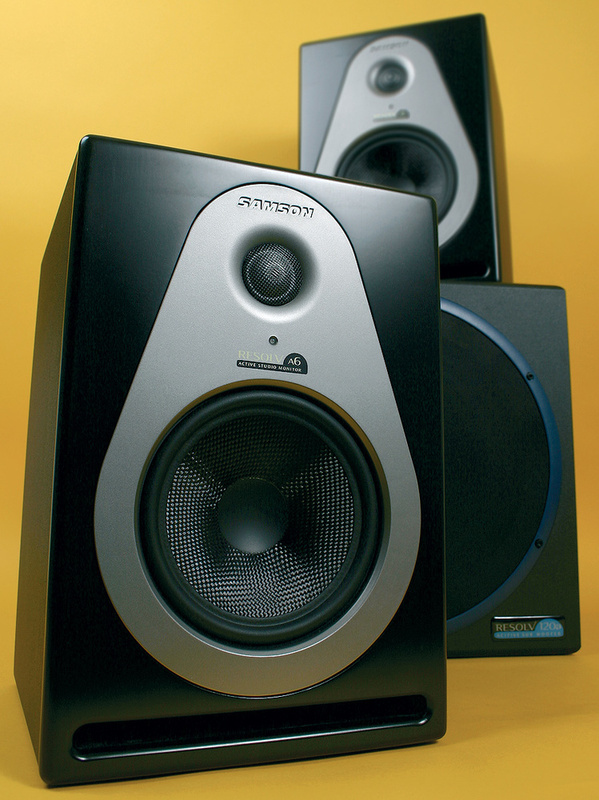 With a10‑inch driver in a ported MDF cabinet, and weighing about 18kg, it is supported on four solid rubber feet. The sub will pass line‑ or speaker‑level inputs through to active or passive satellites respectively, and an adjustable Sweep control adjusts the upper range of the sub's response and the frequency at which the satellite feed is high‑pass filtered. The connections are unbalanced, which is a shame given that the A6s have balanced I/O — so you may need to take precautions against mains hum when connecting everything up. To aid system integration, you get a subwoofer level control and two‑position phase switch. Given the resonance issues I had with the A6's LF response, it was no surprise to find immediate benefits to adding in a subwoofer, which effectively removes the dramatic low‑end roll‑off. The sub can certainly put out a good level, and taking sub‑bass out of the satellites improves their ability to go up loud. I found the sub's contributions rather indistinct and slow off the mark, though, so while the 120A extended the frequency range pretty effectively, it remained a challenge to pick apart and balance the contributions of different parts in the extreme LF range. This isn't really a speaker for critical mixing work, but then it's pretty unrealistic, at this price, to expect a serious mixing tool that can manage these kinds of volume levels, however much phrases such as 'studio reference monitor' are bandied about on the packaging. What you're paying for is interfacing, volume, vibe, build, and cosmetics. You get pretty good value on all these fronts, so if those are your priorities, Samson will, as ever, provide a high bang‑for‑buck ratio. If you're serious about technical mixing issues, though, to my mind you'll get a much more useful combination of headphones and headphone amp for a similar outlay, and that's an option which also bypasses the acoustic problems of typically untreated budget studio rooms. The Resolv A6 is in a fairly packed market, with competition from the upper price ranges of multimedia speakers and the lower ranges of studio monitors. 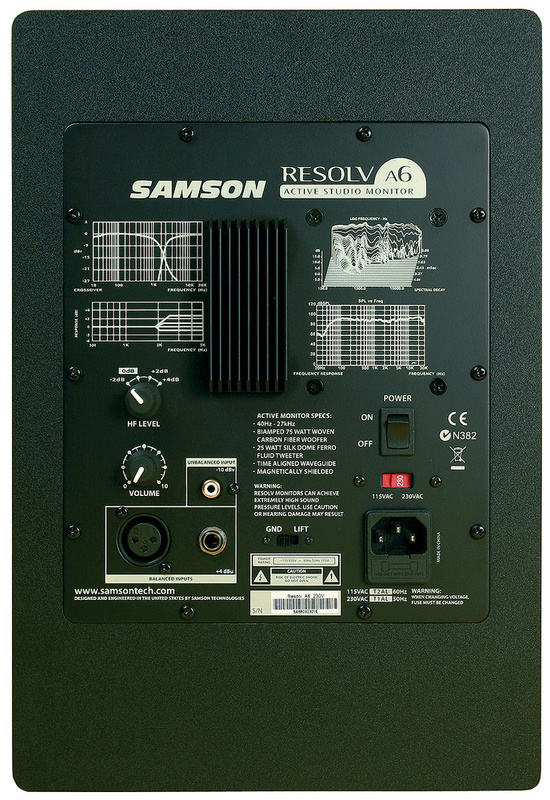 Companies such as Alesis, ESI Pro, Event, KRK, M‑Audio and Mackie all have directly competing two‑way reflex‑loaded actives, and it'd also be worth checking out Samson's own Rubicon 5A, reviewed in SOS July 2005. For a more full‑frequency presentation at lower SPLs, Blue Sky's Exo 2.1 would also be an option. At this price, you also need to take the idea of good-quality headphones seriously, particularly given that street prices for even flagship models such as Sennheiser's HD650 and Beyerdynamic's DT880 Pro fall well within this budget. Full and bright sound with good subjective appeal on most modern commercial material. Decent output level for the money, especially with the subwoofer. Lack of definition in both frequency and time domains makes balance and EQ judgements too unpredictable for serious mixing work. These boxes offer a big sound for a comparatively small outlay, but at the expense of the kind of clarity required for serious mixing. Resolv A6 £310 per pair; Resolv 120A £207. Prices include VAT. Korg UK +44 (0) 1908 857100. Via Korg UK web site. Resolv A6 $399; Resolv 120A Subwoofer $229. 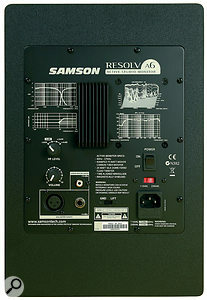 Samson Technologies +1 631 784 2200.